Back in the days (2009), mobile market looked very different from today, less than 5% of email marketing subscribers were accounted for any online activities related to newsletters readers, most of which (95%) used the iPhone. Time has changed! Many questions have to be answered or at least considered by marketers before launching any e-mail campaign. Are your emails designed to render well across not only desktop clients and web-based platforms but also on a variety of mobile devices? Do you know which mobile operating systems block images or support preview text? Does your design work on a small screen? Have you accommodated fat fingers? More than 60% of smart phone users access their email through their mobile device Email marketing will continue, but it will have to evolve to fit into the changing times, by moving from load and blast to a focus on relevant one to one communications. 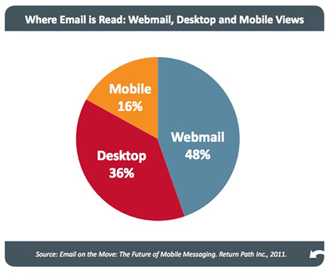 The coming years will see email evolve even further, to adapt to the growth of social. Use short subject line – if you use long subject line it's more possibility that the last words will not be visible in the mobile phone's display. Create small newsletter – If you wish to users read your mail then don't send too wide newsletter, because for long mails the user must scroll too much and its possibility that newsletter shows as a very disturbing way. Send plain text emails – Sometimes it may be better to send plain text emails instead of HTML newsletters, it has the great advantage that the line width is always accepted to the display or window width so the reader does not need to scroll horizontally to read the e-mail. Use Mobile compatible images – Do not include very small and too large pictures in the newsletter because they can be difficult to see on a mobile phone's / smart phone's display so always use Mobile compatible images. Use Mobile compatible text – You should avoid light text on a dark background for the body text because such a text may seem hard to read if the letters are small on the display so always use mobile compatible text. Use Simple email template – Avoid a complex design and sophisticated graphics because it may appear incorrectly in some older mobile phones so always try to use a simple email template. Make attractive header – Important and interesting information should always be placed at the top and to the left in the newsletter because this part is the most visible on mobile phone displays. Give contact info in the mail – If you want to sell any products or serve an offer to your customers then you should always provide a phone number in the newsletter as well as if you have a physical shop or stores then provide the complete address of shop because that is easy to find you . Use Non-English characters carefully – If you use non-English characters like Hindi, Urdu, Spanish etc. 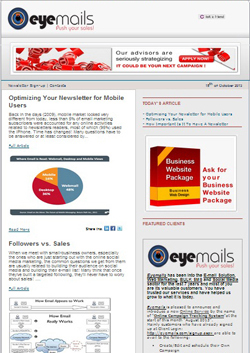 in your newsletter then check carefully that they are shown correctly on mobile phones. 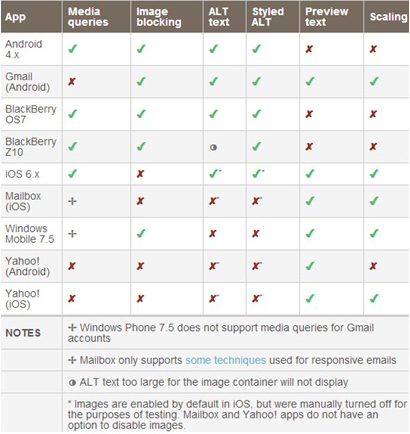 The chart below covers some popular email apps for mobile, and mobile email compatibility basics like support for media queries/responsive design, image blocking, preview text, alt text, and more. Inconsistencies are still bound to pop up, so if you are sending your newletter be sure to test your email on different platforms. If you're sending your newletter through a third party make sure to ask about the mobile compatibility requirements. Call us now on (+961) 5 955925 for any clarification or visit our website www.eyemails.com to read more about Eyemails Services and products. When we meet with small-business owners, especially the ones who are just starting out with the online social media marketing, the common questions we get from them are usually related to building their audience on social media and building their e-mail list! Many think that once they've built a targeted following, they'll never have to worry about sales! It's great to have a significant following that reads your content and thanks you for the value you provide, but unless you convert some of them into paying customers, you'll not be running a business then, probably a free fan club! Having thousands of followers that don't translate into sales isn't really important for your business. Based on these common questions, our answer is built on 3 rules that can separate successful businesses from failing ones! They will buy from you when they KNOW about you! You might think that once a person follows you on Twitter or likes your page on Facebook, then they're aware of your existence! That's true ONLY if they were following 3 people on social media! The average person today follows hundreds of pages and twitter profiles, so how on earth do you expect them to remember your business when they decide to buy a particular product or service? Unless your prospects like your brand, they won't simply spend their money with you. They'll go and invest their money with brands that speak their voice and solve their problems. Your prospects might know about your brand, products and services. They might even like you, but if they don't trust you, they won't buy from you! Now that you know the 3 factors that will help you convert those followers into paying customers, here is what you should do to amplify the know, like and trust factors! How do you get people to KNOW about you or your brand? • You get in front of them on platforms they're already using, whether it's Facebook, Twitter, Google+, their favorite blogs, local events…etc. Basically, any place your prospects are using to hang out, you should be there. • You educate them about your brand, products and services, not in a direct way, but in a more enjoyable, value providing way. Remember, it's always about them! • You encourage them to spread the word about your brand. When that happens, more people will know about you. How do you get people to LIKE you or your brand? • You speak their language. • Constantly interact with them. 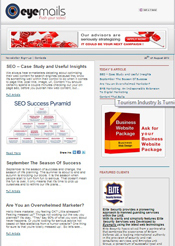 • You give them a wonderful user experience through your quality content. • You listen to them. • They realize that you care! How do you get people to TRUST you or your brand? • You've never disappointed them before. • They realize that you're reliable. • You always deliver what you promise, if not more! • Their friends, family and pretty much any person they trust recommend you. It has been observed that more than 60% of the newsletter subscribers are more likely to buy from the companies that they have subscribed to. Subscribing to a company newsletter shows a high level of interest. Subscribers are willing to read all your news and stay up to date to your latest activities. Subscribers must be appreciated by any business and treated with care. Showing appreciation to your subscribers can start with promoting exclusive offers. So, what's the importance of a newletter? A newsletter is a cost-effective medium for building relationships and maintaining regular contact with customers and prospects. Issuing newsletters by email to all of your customers and prospects is a low-cost method of communication, leaving more in your market budget for advertising or other promotional activities. Publishing a newsletter gives you the opportunity to increase awareness and understanding of your company and its products and services. To encourage readers to find out more, include links to more detailed information on your website. A newsletter can demonstrate your expertise and build confidence in your company as a potential supplier. To establish leadership, include articles that cover important issues in your market sector or share information on industry research. Provide details of any conferences where your company is making a presentation. 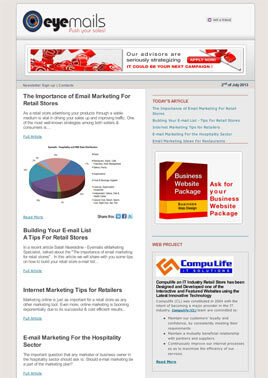 You can use newsletters to promote products and services or launch new products. Including information on special offers helps reinforce the effect of your advertising and promotional campaigns. Running special offers exclusive to readers enhances the value to the newsletter. Issuing newsletters at regular intervals -- weekly, monthly or quarterly – helps you maintain contact with customers and prospects between purchases or sales calls. 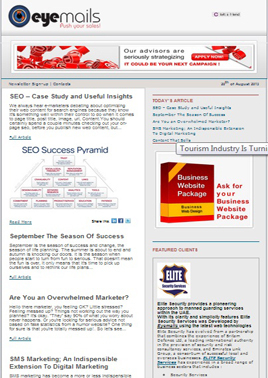 Newsletters can help you increase the coverage of your target audience. By placing information about the newsletter on your website, you can capture contact details of new prospects by asking visitors to subscribe. 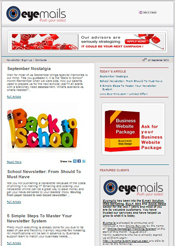 At Eyemails we encourage every company to have its own newsletter system. Having a list of subscribers is be very beneficial to promote your business and to keep your audience up to date. 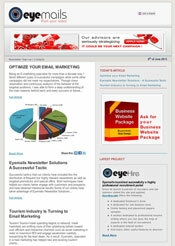 Eyemails can help you build that list of subscribers. Ask for Eyemails newletter system used by many satisfied clients, resulting in high number of new subscribers and new leads who showed interest in the client business. 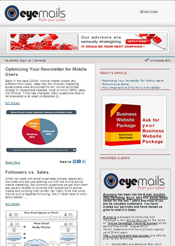 With more than 300,000 subscribers at Eyemails database we can help you launch a successful e-mail campaign. With time you will build your own database of subscribers which you can use to stay in touch with your own clients and to generate more leads. 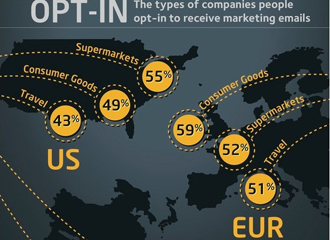 What differentiate Eyemails database is that we respect our subscribers privacy and respond promptly to any request. If any subscriber wishes to unsubscribe, we will remove his account within 48 h.
We aim to keep our database fresh and updated by cleaning and filtering hundreds of obsolete accounts every month. On the other hand we receive around 3000 new subscribers on monthly basis. All new subscribers are reviewed and categorized by our support and technical team, ensuring the best results for targeted e-mail campaigns. 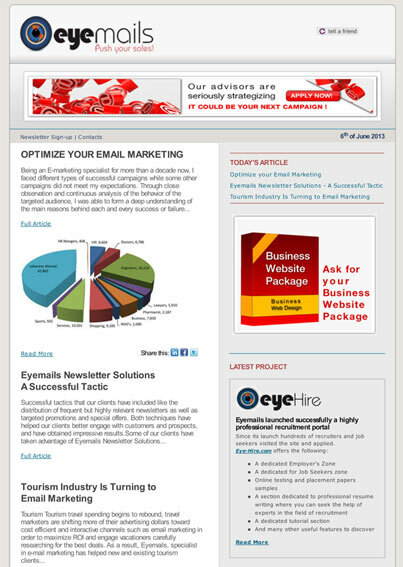 Thanks to our esteemed clients Eyemails is growing fast to be one of the leaders in its field. It is never too late to try our e-mail services, we are certain to meet your expectations.